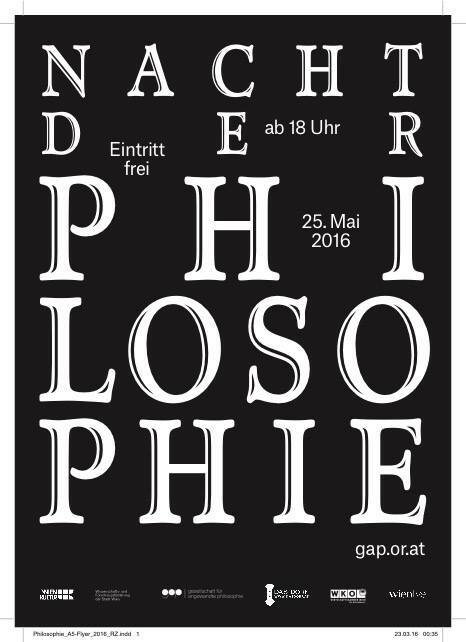 This year I will appear on stage on occasion of “The Night of Philosophy” 2016 (“Die Nacht der Philosophie”, in Vienna’s “zur rezeption”, Sperlgasse 6, 1020 Vienna, at 19:00 o’clock. 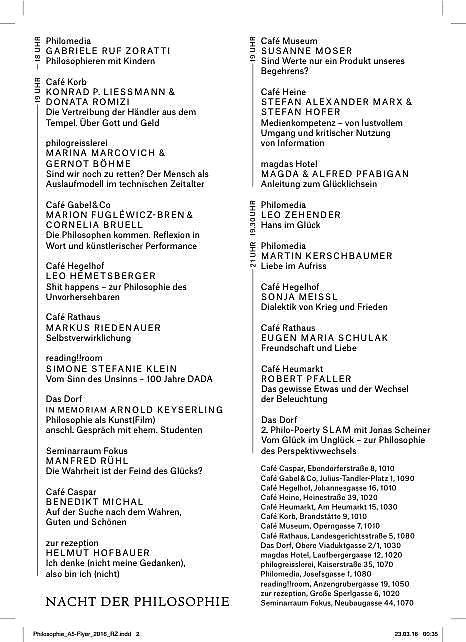 The title of my performance is “I (do not) think (my own thoughts), therefore I am (not)” (“Ich denke (nicht meine Gedanken), also bin ich (nicht)”). Only recently, however, it came to my mind that also the basic idea of Descartes (which I had taken for granted), is flawed: I just need to compare “I think, therefore I am” with my own experience to understand that it is not true. E.g. after some hard days of work I do need at least one full day (if not more) to come to myself again. It is just not true that I am able to beware the conscience of the fact that I am thinking this when I am thinking thoughts that are not mine and do not evolve from my own motivation. Anyway, the topic of my “evening” during the “Night of Philosophy” will not just be that Descartes is wrong, but the truth lies in the opposite direction. I will argue that the conscience of your existence is not just something that cannot be lost whatever you think, but that you have to work hard and permanently on your thinking in order to regain it sometimes. Writing a diary regularly is a good means for that end to start with. It also helps if you have a friend with whom you can discuss your ideas in order to develop them further, and who will not stop you after the first words you utter. In this series of texts I have tried to describe phenomenologically the following experience: When you try to discuss your ideas with other persons, it happens nowadays quite often – and even more in the case when your discussion partners have an earned an academic degree – that your interlocutors just cut your words by saying something disappointing like: “That’s not true.” The feeling you will have then is that they did not even bother to try to understand the problem you are working on. Instead of that they pulled your statements out into a public world, where of scientific or political assertions and qualified them as “not true in this world”. This phenomenon I labelled as “oblivion of the concept of the “idea”” for, basically, an idea is “your idea” and to understand an idea that you utter means to understand you, to understand the problem how you see it, and to understand the solution the way you have worked it out. My conclusion in those series of texts therefore was that studies at the university (and not only those in the subject of philosophy) make us forget the concept of what an idea is by forcing us to understand ourselves as living in an objective/scientific/logical world where something like personal ideas does not even exist. In this world all our ideas have to lose their attribute of being our ideas if they want to be considered as valid arguments by ours. In other words, in acadamy and in science we are trained to cultivate a way of thinking which is not our thinking or where thinking is not an activity of ours. The consequence of this training are conflicts and crashes in interpersonal communication because academics are not longer able to imagine themselves in the shoes of the other person and lack empathy. Another prerequisite for my ability to understand that Descartes’ Claim “I think, therefore I am.” was a story I once read in a book by José Ortega y Gasset. Gasset related that he was in the zoo observing the monkeys. Those monkeys moved around quickly with all attention directed towards their surroundings in a way, that Ortega fatigued by just watching their constant tension. He concluded that the capacity of thinking must be something that allows you to look into yourself, to be at home in yourself, without beeing forced to watch your environment all the time. I do not know anything about monkeys (and I suppose that Ortega did not either), but this thought is really inspiring. Its consequences are that thinking does not mean to be focused on something (because the monkeys are focused all the time) thinking it through logically, but that in reality it is completely the other way round. The capacity of thinking means that you are able to refrain from focusing on some problem and look into yourself instead. It means that you are able to daydream, to think wishful thoughts, to listen and wait for the new thoughts that are coming to your mind – in one word, the capacity of thinking means that your are able to think what you want to think and not what your environment forces upon you to think (because this is just what happened to the monkeys in the zoo). The same thing happens with philosophy: In the subject of Philosophy the students taught ideas of famous philosophers which are alien and unrelated to them instead of presenting those philosophers to them as examples of human beings who have thought by themselves. The opposition against and indignation of many people at philosophy is all too undertandable: It is a sign of mental health when you defend yourself against the social requirement of studying things you are not interested in and thinking about thoughts that do not have anything in common with you just because they are important in the History of Philosophy. In science it is unavoidable to think thoughts that are not yours; let the differencia specifica between science and philosophy be that philosophizing means thinking your thoughts, or finding out which thoughts among all of them are your thoughts. Otherwise it will not only be impossible for the human individual to think indepently, it also will not really exist – because if you always only think the thoughts of others, you are not. Helmut Hofbauer: Twisten mit dem Verstand. tredition, Hamburg 2015. You can order the book here or also at Amazon. When talking about philosophy with non-academics I have always the problem that I have made certain experiences during my philosophy studies at the University of Vienna which are unknown to them. One essential experience of this kind is that the minds of university students are transformed during their studies in a manner so that afterwards they are not able any more to communicate ideas or respond accordingly to ideas of another person in a conversation. The central idea of this series of texts is: An idea is an idea of a human being. When a person tries to communicate an idea to another person, what she is doing is to explain to the other person an attempt of a solution of a problem or of a question she concerned with. However, when this person turns with her idea towards a graduate of a university, what will happen? The university graduate has undergone scientific education. This means that for her ideas of people do not exist anymore (because they would be “subjective”), she only knows an objective reality. So she will most probably respond to the first person something like: “Of what you have said this and this and this is wrong.” By doing that she will absolutely frustrate the first person for what those person wanted in the first place was to find some understanding for her concern and for the relevance this very problem or question had for her life. The thought on which the title of this series of texts is based is: The term “idea” is used improperly in academic or scientific discourse; anyway, as we use it differently in everyday language, the use of “idea” in academic discourse is still profiting parasitically from its meaning in everyday language. And this meaning of “idea” in everyday language could be lost someday soon (because university students are trained so rigorously to forget it that this attitude becomes their second nature), and what happens then is that this word altogether loses its meaning for us. To make things clear: in my understanding, “idea” in everyday language means “someone’s idea”, and in academic discourse it means “some kind of statement that can be true or false”. As philosophy tries to solve the problems of human beings, it is especially difficult to discuss a problem philosophically with a university graduate because for the university graduate problems and ideas are something that can stand alone, they do not need any subject that holds them. This is also valid for university graduates of philosophy. That’s the reason why I recommend everybody who is interested in philosophical questions not to study philosophy at the university: As long as you do not study philosophy you can try to solve your philosophical problems, but after your philosophy studies at the university you will be deprived of your problems. They will be objective problems that are of no special concern to you. Saying that a problem is “my problem” is a form of appropriating one’s own thinking. The common denominator of all texts of this book is autonomy of thinking. To convince us that my problems and your ideas are not my problems and your ideas but objective entities that exist in some kind of “platonic heaven” of today’s scientific community is a method of dispossing us of our own thinking. Another method is long years of drill. Why does a pope or the American president practically never step down from their offices? The answer is: because they have invested long years of work and a great part of their lives in getting into their offices. Now in one text I have taken Ludwig Wittgenstein as a negative example for this hypothesis: While nowadays a young academic philosopher has to spend long years of formatting the footnotes of his articles in order to submit them to scientific journals, Wittgenstein actually did not publish any academic work during his lifetime. He was the son of a rich father, he had been primary teacher in Lower Austria and the architect of his sister’s house before he became university professor in Cambridge. So he was free as a bird, and this is why it was no surprise that in Cambridge he produced a philosophy his doctor father Bertrand Russell did not like. When talking about famous professors we usually tend to think in terms of genius and intelligence. By doing this we underrate the significance of drill. Normally a person does not become professor because she is intelligent but because she is intelligent and has endured the drill. 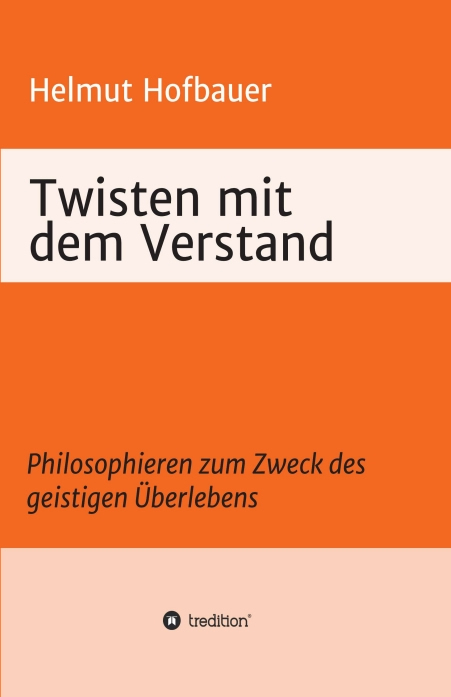 It is important that a case like that one of Wittgenstein from the institutional point of view was a mistake – and was something that nowadays will not occur anymore. The book contains two texts on Tomas S. Kuhn’s book The Structure of Scientific Revolutions. What I find interesting in Kuhn’s theory of science is that he described science as a social enterprise. However, if society enters into science society’s chaos and unreasonableness will also enter into science. And because it cannot be true what should not be true, philosophers have found ways of interpreting Kuhn’s theory as if it was not a social theory of science. Before I knew that I had thought that I could use Kuhn’s theory in order to support my ideas on science. But since I know it I also know that every rational argumentation on the topic of science as a social institution will remain unheard because philosopher refuse to listen to it – the same as they refuse to listen to Kuhn. The frame of my book is constituted by two texts on personal knowledge. One is on José Ortega y Gasset’s book El tema de nuestro tiempo [The topic of our time] and the other on his pupil’s, Julián Marías’, book Razón de la filosofía [Reason of philosophy]. The topic of Ortega’s era, and this is almost one hundred years ago (1923), was that he thought it was time to conceive thinking and knowing as activities of living beings. This is what he also called “life philosophy” (filosofía de la vida). It means that in philosophy we should not look for objective truths but for truths relevant to persons thinking them. After all, when I remember my time as a philosophy student at the university and how I asked my professor what she thought about my seminary paper and “There is a mistake in the footnote on page 23.” – was the only answer I got, this is exactly what I am concerned about: My teacher then did not understand what was relevant for me (or if she had understood it her scientific attitude did not allow her to admit it to me), and that is why the conversation about my paper turned into a discussion about the footnote on page 23. In science, in the end no fact is more important than any other fact. So it was science to remind me of the footnote on page 23. However, I had wanted to talk about my seminary paper in order to learn something about it; I did not learn anything from the remark on the footnote on page 23 – it just served to drill me. These two texts on the two Spanish philosophers allude to the fact that in order to come closer to autonomy in thinking, we would have to re-appropriate our own thinking, we would have to make thinking our thinking again. And this would start by conceiving a thought or an idea not just as a sentence that can be objectively true or false but as a concern of relevance for the life of the subject thinking it. Despite the fact that Ortega’s approach is basically quite straight and common sense, science and scienticism (the exaggerated belief in the power of science) are so strong nowadays that Ortega’s topic of his era sounds to us like the most esoteric thing imaginable. In other words, I think that if someday in the future we want to achieve autonomy of thought, we would have to go right down to the bottom, to the ultimate cause of the problem: and this cause is that today – in the shade of science and its concept of objective truth – it is forbidden that I consider my ideas to be my ideas. That the ban of personal thinking does not lead to objective truth but rather to the beliefs of different tribes and groups of people is the topic of another text in this book, a text on isms. Also in today’s philosophy isms are abundant: internalism, externalism, reliabilism, coherentism, contexualism, indexicalism and so forth. They force you to join a group before you have even made up your own mind. 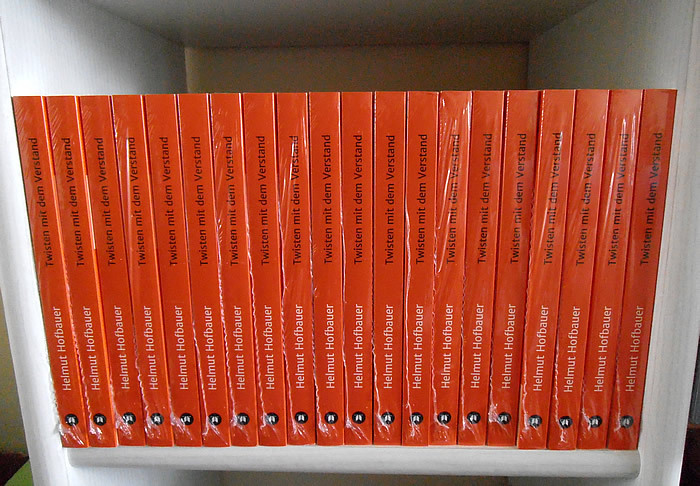 The title of the book stems from a song by the Austrian songwriter Heli Deinboek. In this song he describes the zombies we call “normal people”. These are persons who work and consume as society expects them to and are desperate about the senselessness of their lives. I have always thought that it is necessary to twist a lot with one’s own mind in order to meet this situation. That is: to move one’s own mind, to think a lot, to philosophize. It should be clear by now that by “philosophizing” I do not mean thinking Plato’s thoughts or those of Descartes or those of Donald Davidson, but thinking my own thoughts. By thinking my own thoughts I am moving myself, maybe in the form of a dance. The subtitle of the book is: “Philosophizing with the goal of surviving mentally”.